Our upcoming Stake Conference will be the weekend of March 15-17, and the Stake Presidency is looking forward to being with all the saints of the Kent Stake. We will begin our Stake Conference by inviting all temple recommend holders to join the Stake Presidency in attending the Temple on Friday night, March 15th, for either the 4:00 or 6:30 p.m. session. However, if these times don’t work, please find a time that does work in your schedule the weekend of Stake Conference. On Saturday evening the 16th, the adult session for all members 18 and over will be from 7:00 – 8:30 p.m. followed by a brief social – please make this meeting a priority. Sunday morning the 17th, we will hold a Priesthood leadership training meeting from 7:00 – 8:30 a.m., and then the General Session of Stake Conference will be from 10:00 – 12:00 p.m. at the Kent Stake Center. 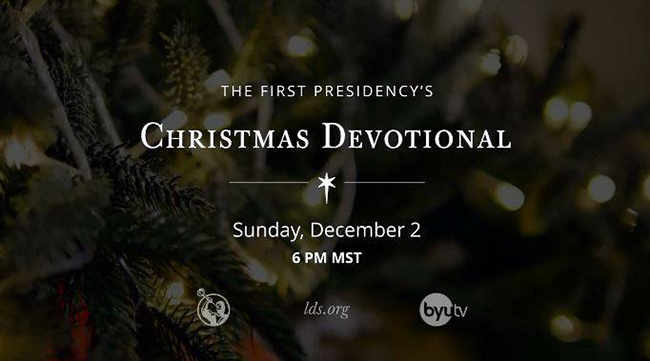 It will also be broadcast from the Stake Center to the Kentwood Building. As a presidency, we have been preparing for this Stake conference with much prayer, and we look forward to being with you as we strive to draw closer to our Father in Heaven through our worship. 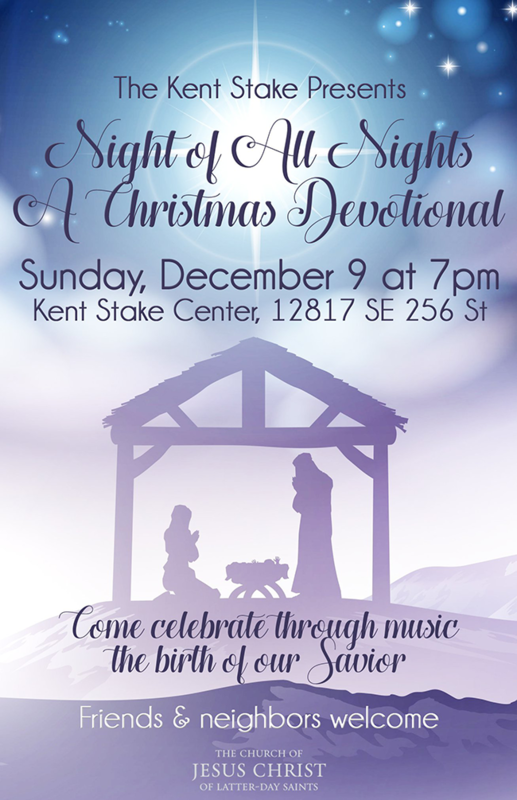 You are invited to a special Christmas service. 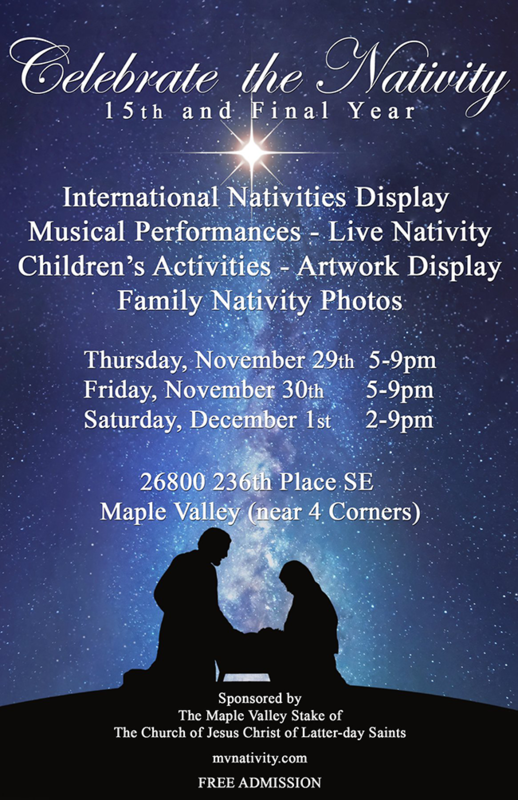 Attend a special Christ-centered sacrament meeting that will focus on the wondrous birth of Jesus Christ with appropriate messages and Christmas music… please come! Park Orchard Ward – 9:00 a.m.
Spanish Branch – 11:00 a.m.
Clark Lake Ward – 1:00 p.m.
Lake Meridian Ward – 9:00 a.m.
Scenic Hill Ward – 11:00 a.m.
James Hill Ward – 1:00 p.m.
Lake Sawyer Ward – 9:00 a.m.
Crestwood Ward – 1:00 p.m. The Kent Stake youth leaders have launched a new web site especially for young men and young women at youth.kentstake.org. 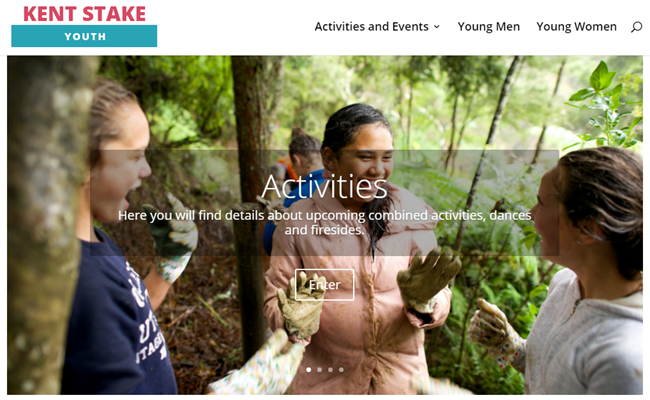 Please visit this new web resource for up-to-date information concerning our stake youth (activities, special announcements, upcoming events, etc.). 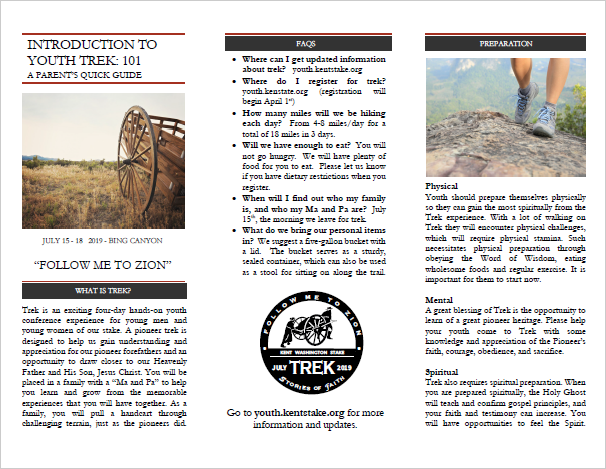 The previous YM site and YW page can be referenced under Resources > Archived Sites & Pages. The weekend of October 6th and 7th will be General Conference. This will give us the opportunity to hear from the Prophet of the Lord, Apostles and other general leaders. The Stake Presidency encourages you to make the general conference sessions a priority. The weekend following, Oct. 13th and 14th our stake will be holding Stake Conference. The Stake Presidency is looking forward to being with all the saints of the Kent Stake. 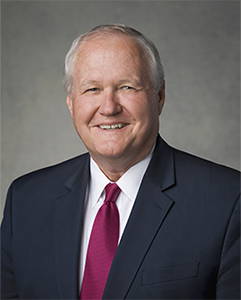 We are excited to share that Elder Anthony D. Perkins, a General Authority Seventy will be visiting us for our Stake Conference. The first session of Stake Conference begins with a Stake and Ward Council Leadership meeting on Saturday the 13th from 4:00 – 6:00 pm. All stake and ward auxiliary presidencies, Bishoprics, High Council and Ward Mission Leaders are invited to attend. On Saturday evening, the adult session for all members 18 and over will be from 7:00 – 9:00 pm – please make this meeting a priority. Sunday morning the 14th, the General Session of Stake Conference will be from 10:00 – noon. The General Session will be broadcast to the Kentwood Building from the Stake Center. As a presidency, in preparing for Stake Conference we have received direction from Elder Perkins and we are excited for a wonderful weekend. We look forward to being with you as we strive to draw closer to our Father in Heaven through our worship. 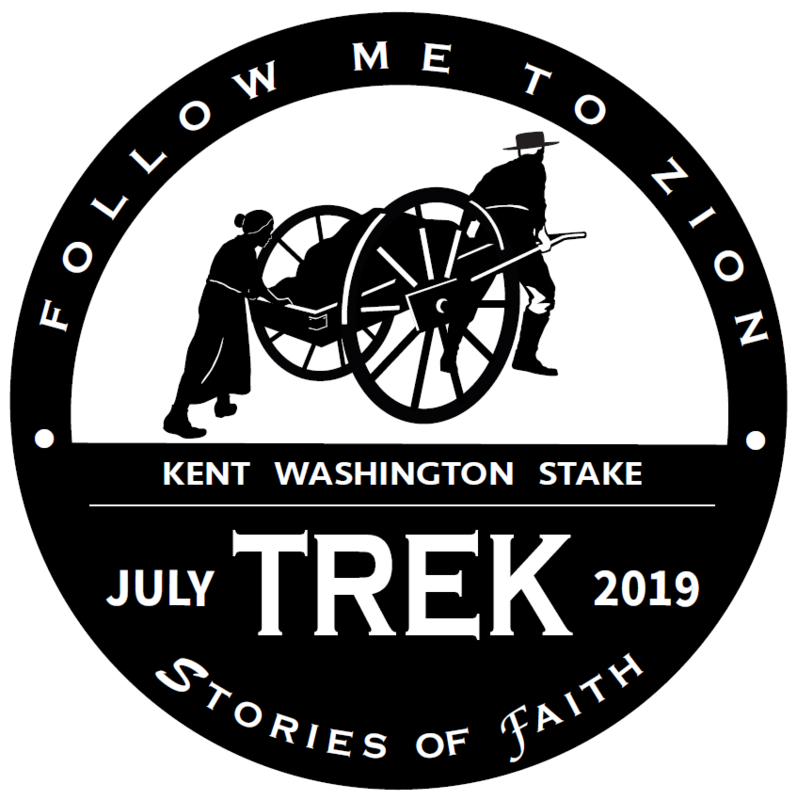 September 15, 2018 * 9 – 11 a.m.
For the National day of service the Kent Stake will be participating with the City of Kent with the TeamUp2Cleanup event. The event is coming this Saturday Sept 15. We will be helping at Clark Lake Park with brush removal and picking up litter at a few other Kent parks. Most of the effort is needed at the Clark Lake Park but additional parks/areas will be available for litter pickup for families with small children. If you are able to help with the heavy underbrush please bring gloves and equipment (clippers, shovels, picks, blackberry brush cutters, etc.). There will be some gloves and equipment available to use at the park. The Clark Lake Park gate will be opened for plenty of parking onsite (enter from 240th street). We plan on working from 9 a.m. to 11 a.m. Please come to the stake center first to get an assigned area and light breakfast (muffins, fruit, water, etc.) between 8:30 and 8:45 a.m. We look forward to serving with you on Saturday. Need tickets? Contact a member of your bishopric or branch presidency for assistance. Stand-by lines also available. 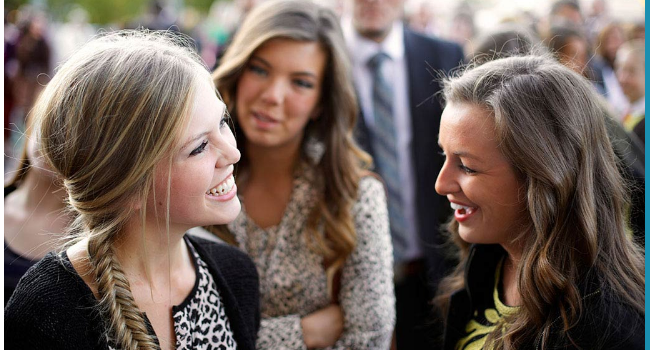 There will a BYU-Idaho Pathway Fireside on Sunday, July 29th from 7:00 – 8:00 p.m. at the Kent Stake Center with light refreshments after the fireside concludes.